First of all, if you aren’t interested in history or houses you might as well stop reading now. Just Joking! You must read this (I am placing you under my spell…can you hear my evil laugh?) Fun aside, you might find my condensed version easy to read if you want to check it out. Sunday afternoon found my friend Annette and I attending the Historic Homes Tour of our town of Victoria, Texas. A few years back we both discovered we enjoyed attending the tours and have made a point to attend it together ever since. (But It’s been an annual event for the city since the 80’s.) I always enjoy looking at the beautiful old homes with their exquisite architecture – back when carpenters took pride in their work and things were built to last. I like learning the history as well. 2. One of the homes was actually set up as a funeral home at one point in time. We only were allowed to see part of the bottom story of it that is being used as offices while the rest of the house was rented out. It’s supposedly haunted (no surprise there!) with random noises and as one of the tour guides mentioned that a lady that works in the home said she often hears the toilet lid opening and closing repeatedly on it’s own. Guess the ghost was taught well, LOL. It looked like there was still a lot of work to refurbish this home and it seemed quite large so hopefully when it is finished they will open the house up for the tour in its entirety. 3. An Italian immigrant ‘Guiseppe Bianchi’ built the house at 409 S. William Street around 1905. Everyone called him Joe and he operated his own blacksmithing business out of this house for 58 years. The fence surrounding the house still today was hand forged by him. He was famous for his hand-made spurs which were on the boots of almost all the ranchers of South Texas. One of the tour guides actually had one of these famous spurs in her possession as it was passed down in her family and showed us – it even had a little piece on it that was used to open bottles! The other unique thing about this house is that it is used as the local Chic-filet owners corporate offices. (Two huge, very cute black and white chic-filet cows graced the back yard fence and chic-filet articles filled the rooms, lol) But I thought it a very cool idea to make your offices in a historical home instead of a generic office building. 4. The last place we saw had the most stories to tell as the former owner donated it to three organizations so the house could always remain a Texas Historic Landmark. It was given to the Victoria Chapter of the Daughters of the American Revolution, the United Daughters of Confederacy and the Daughters of the Republic of Texas. They hold their meetings on the first floor where they keep their historical items we learned the stories of. The 2nd floor we didn’t get to see because it was rented out – they use the rent money to do repairs and upkeep on the house and hope to continue it’s refurbishing. My favorite thing about the old homes is the details in the woodwork – from the trim, stair banisters to the outdoor Victorian designs. Learning about how some people had to work so hard to remove the paint to reveal some of this beautiful work makes one question who in their right mind would do such a horror as to paint over lovely wood? It should be a sin! 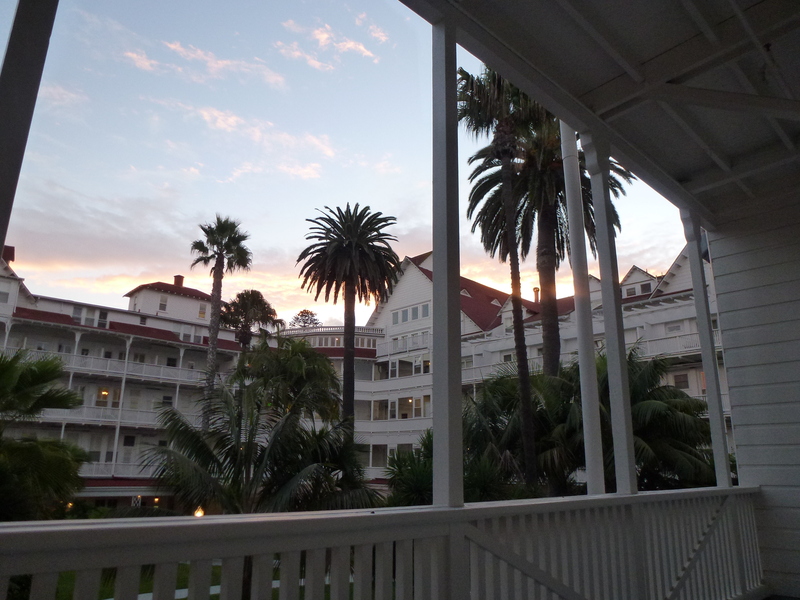 Last week I ventured off with my husband to a location I had never been before, but I did watch a Travel Channel show that featured it and alerted me of the haunted happenings that occur at the Hotel Del. My husband needed to be there for business and I just went along as his entertaining sidekick. (It’s a hard job, but someone has to do it! 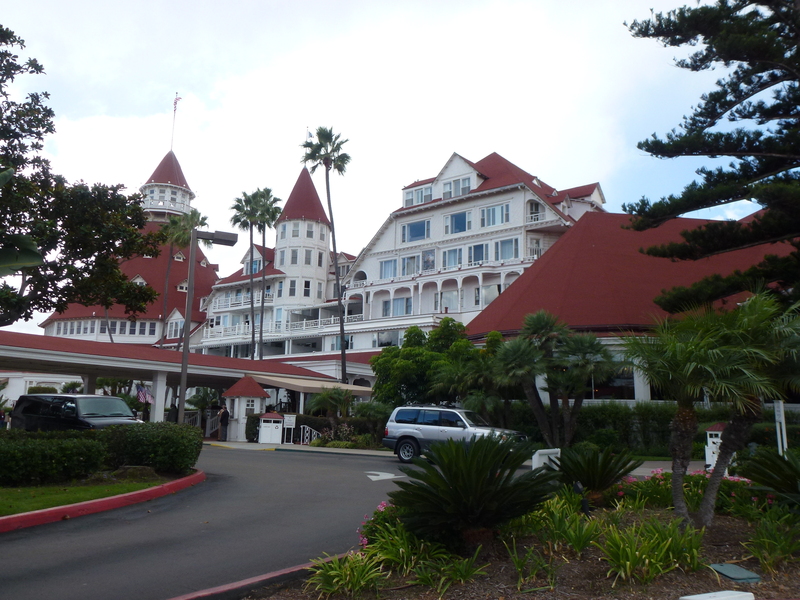 🙂 I had heard many good things about the Hotel Del Coronado on Coronado Island near San Diego, California but I had never set foot in California before and love to experience new locales. Especially when it involves beautiful, classy resorts near mother nature’s picturesque glory. Flying first class also helps enhance the experience. My hubby is a professional financial planner (or as I affectionately call him, a ‘numbers nerd’). Some people tease him by calling him ‘cheap‘ but he prefers the term ‘spendthrift‘. He looks at financial matters with common sense and business acumen in a measured analytical process. This business event had sponsors and because of the amount of money he had invested for his clients he was able to get the hotel and airline tickets for no charge to us. That was for the basics only though and since when my darling husband decides not to be cheap he goes for ‘extravagant’ – he paid to upgrade not only the flights but also the room. It justified it in our minds to spend some money to enhance the experience since technically, it was our vacation for the year. We flew out of Austin, Texas heading to San Diego, CA via Dallas, TX. I enjoyed the 1st class comfort of flying (i.e. full course meal and unlimited wine refills) and dozed off for a short time before reaching our destination. I know this because my husband proudly revealed the picture he took of me with his phone later – of me slumping in the seat like a tire losing air, mouth open and face slack. (Not a flattering photo.) After arriving at the San Diego airport we were treated to a limo ride to the Hotel Del. The Hotel Del was built in the Victorian style and finished in 1888. It has a long history of hosting Presidents, Royals and Hollywood stars. During it’s history it has also hosted at least one ghost, some say more. The show I watched on the Travel Channel said that some of the haunted events documented include: flickering lights, TV’s turning off and on by themselves, sudden cold spots, unexplained noises, items being moved by themselves and sightings of a lady in black Victorian style clothing. Most is attributed to the ghost of Kate Morgan, AKA Lottie A. Bernard but there were other stories in internet pieces about there possibly being a child ghost peforming childish pranks such as hiding things and whatnot. Nevertheless, the hotel is well-preserved and the historic ambiance is comforting and omnipresent without being scary or macabre. Lush, dark woods abound in the Lobby and stairwells. The old, wooden floors creak underneath the carpeted hallways as you walk them. Indoor and outdoor stairways abound throughout and it takes a bit to learn your whereabouts as there are multiple paths to all destinations. There are nooks and crannies with Victorian style furniture placed randomly around inviting guests to just sit and enjoy their surroundings. I almost expected to see Sherlock Holmes smoking a pipe while Watson sat by his side taking notes. Upon entry into our suite we were greeted with a sitting area that included a large walk in closet as well as a small fridge hidden underneath the large flat screen TV cabinet. French doors took us into the bedroom that had the usual nightstands, writing desk, another large screen TV and a cozy chair with an ottoman. The windows were extra large with white wooden shutters. My favorite part of the suite was the large veranda with it’s comfy wicker chairs and tables. The slight breeze and shade intermingled with our view of the gardens of the courtyard and the sound of the Palms trees rustling in the breeze epitomized a state of relaxation. The whole mood of the suite seemed to invoke a feeling of southern plantation comfort and elegant Victorian luxury. Dragonfly Chat · Humor, life, kids, family, books, writing, reading, religion, travel. My opinions here.